Cal Poly fraternities and sororities are working closely with Student Affairs and others across campus in a continuing effort, begun last spring, to enhance diversity, inclusion and wellbeing education within the university’s Greek Life programs. Student Affairs, in collaboration with other campus partners, has implemented a series of education and training initiatives within Cal Poly’s Fraternity and Sorority Life community. These initiatives are part of universitywide educational efforts to create a more inclusive and welcoming campus climate. These and other efforts around improving the climate of Greek Life are among the recommendations from an outside consultant who was asked to audit the university’s Fraternity and Sorority Life programs over the summer, in the wake of several racially insensitive actions tied to campus fraternities last spring. As part of the university’s ongoing campus climate efforts, Fraternity and Sorority Life chapters will be required to participate in quarterly diversity and inclusion trainings, which will be conducted in collaboration with the Cross Cultural Centers and the assistant vice president for student affairs—diversity and inclusion. Trainings will focus on relevant topics and ideas including cultural inclusivity, micro-aggressions and unconscious bias. Read more here. The university is still accepting input and the campus community is encouraged to visit the Strategic Plan website to learn more about the process, the foundation planning documents, and most importantly, to view the draft of the plan (in brief and extended versions). Pay special attention to the strategic priority and goal levels, which are furthest along. The lower levels of the plan, including the potential initiatives and tactics, and the potential measures of success, are presented more as illustrations of how goals might be achieved than as specific university commitments. Working groups will be formed and continue to develop these aspects of the plan during the 2018-19 academic year, after the final plan is completed and adopted by the university. Provide feedback by attending an open forum from 11:10 a.m. to noon on Thursday, Oct. 25, at the Berg Gallery (No. 5, Room 105). Or provide a written comment via the online form on the Strategic Plan website. A panel of media experts from around the country will address the challenges facing journalists and their readers, viewers and listeners at the Journalism Department's third biennial Jim Hayes Symposium, 7-9 p.m., Friday, Oct. 12. Reporters and editors have been forced to adapt as news stories evolve instantly on social media and tech giants continue to dominate news distribution and ad revenues. Amid all that’s changing in a tweet-centric culture, how do we ensure the fundamentals of news gathering: investigative reporting, journalist integrity and giving a voice to the voiceless? Symposium speakers: Cindy Carcamo, Los Angeles Times staff writer; Martin G. Reynolds, director at Reveal Investigative Fellowships; Jan Schaffer, ombudsman for the Corporation for Public Broadcasting; David Rothschild, economist at Microsoft Research NYC; and Lauren Williams, editor-in-chief at Vox. Kevin Riggs, senior vice-president at Randle Communications, will moderate the discussion, and Peter Hartlaub, pop culture critic at the San Francisco Chronicle, will serve as master of ceremonies. The Jim Hayes Symposium will be held in the Advanced Technology Lab (No. 7) on campus and is free and open to the public. RSVP recommended. Head to Hollywood with Cal Poly Magazine to discover the alumni who are creating your favorite movies and TV series, from "The West Wing" to "Westworld." The issue also features stories of faculty exploring scientific principles with monks in Bhutan, students devoting their summers to Learn by Doing, and a botany course venturing into California's most diverse ecosystems. 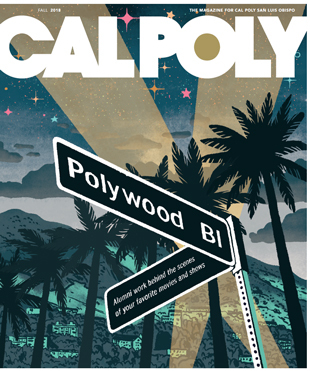 All these stories and more are in the new issue of Cal Poly Magazine, now online. Look for print copies in magazine racks throughout campus now. Spirion, a data loss prevention software, has been installed on all university computers used by staff and faculty as part of an ongoing effort to safeguard Cal Poly’s employees and protected data. 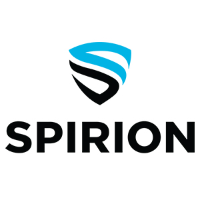 Spirion is designed to search for Level 1 data, such as social security numbers and credit card numbers, the way anti-virus programs search for viruses and malware. Faculty and staff can now proactively scan their computers for sensitive data and find out where it’s stored, in order to safely delete it or move it to a more secure location. In 30 days, summary reports of the Level 1 data searches will also be available to Cal Poly’s Information Security Officer to assess risk. The California State University system selected Spirion, which was previously known as Identity Finder, for use across all 23 campuses and reached an agreement with each of the CSU unions, who recognized the value and importance of the software as part of our security processes. To learn more about Spirion, visit http://bit.ly/CPsecurity-spirion. To find out how to run a scan on your computer, visit http://bit.ly/CPspirion-scan. 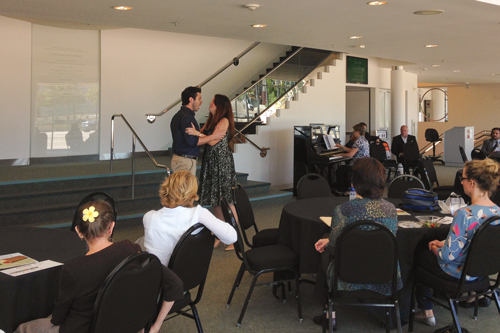 The Mary Stuart Rogers Foundation awarded $87,500 in scholarship funds to 25 Cal Poly students at an Oct. 5 luncheon in the Rossi Grady Lobby at the Performing Arts Center Pavilion. The scholars represent all of the university’s six colleges. Thirteen students were first-year recipients, 10 were second-year scholars and two — Angelique Salinas, a fifth-year architecture major, and Andrea Zylstra, a senior studying agriculture business — were third-year recipients. Each student received an award of $3,500 and other keepsakes. They join more than 280 other Mary Stuart Rogers Scholars who were honored over the past 18 years. “We are here today to celebrate our skilled and committed scholars, who through their hard work and determination — both in the classroom and in their communities — make us Cal Proud,” said Phil Bailey, dean emeritus of the College of Science and Mathematics. “In doing so, we also honor the memory of Mary Stuart Rogers, a woman who committed her life to supporting education and human service organizations through her foundation, which has been in existence for more than 30 years.” Launched in the 2000-2001 academic year at Cal Poly, the Mary Stuart Rogers Scholarship Program honors students who demonstrate academic excellence, personal integrity, leadership and community service. Scholarships are awarded to full-time junior, senior and credential students who have demonstrated a commitment to their personal growth. Preference is given to students from Stanislaus County. Participating in the annual celebration were Mary Stuart Rogers’s son Col. John Rogers, his wife, June, and their daughter Janet Rogers. Awardees also included: (second-year scholars) Eric Bettencourt, electrical engineering; Derek Breshears, industrial technology and packaging; Molly Cluff, child development; Caden Farquer, bio-resource and agricultural engineering; Julie Fogarty, business; Jennifer Guzman, biology; Kelly Habeeb, liberal studies; Andrew Jensen, agricultural and environmental plant sciences; Jaycee Spence, animal science; and Denise Thompson, psychology; and (first-year scholars) Gabriella Borges, recreation, parks and tourism administration; Mark Borges, environmental management and protection; Elizabeth Roseman, food science; Clarissa Flores, city and regional planning; Seth Heppner, history; Fiona McBride-Luman, animal science; Lily Medrano, kinesiology; Jessie Morales, civil engineering; Alex Pena, agriculture and environmental plant sciences; Ashley Pierce, animal science; Michael Romano, civil engineering; Elleis Souza, omputer science; and Lauren Turner, English. Honey, Everything's Coming Up Roses (and Marigolds)! Work continues on the Cal Poly universities 2019 Rose Float entry, “Far Out Frequencies,” in anticipation of the move down to the Cal Poly Pomona campus on Oct. 20. On Saturday, Oct. 6, the Rose Float team put volunteers to work in Building 50L on float structures, hydraulics, electronics and decorations. But while the team and scores of helpers welded, grinded, sorted and readied float decorations, a smaller group was working at the growing grounds off Highland Drive, harvesting marigolds. There are more than a half-acre of the flowers spread out in 20 bands of bright yellows, orange and reddish orange aromatic blooms. 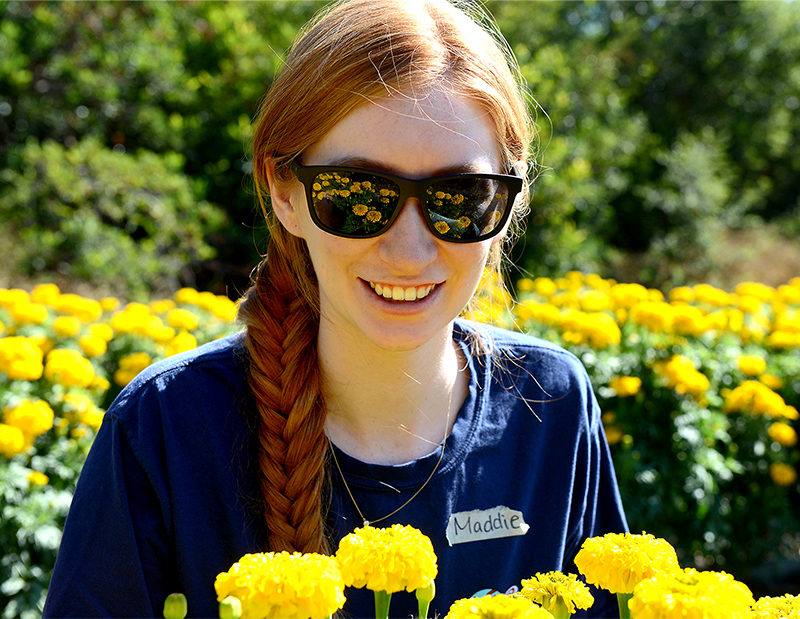 Students planted the flowers in mid-August and began cutting blooms on Sept. 17. (The plants may produce blooms through late December — in time for Decorations Week — and beyond.) Kate Worrell, flower field manager, said the fresh blooms are being dried. “All the orange and red color will be used for the stripes on the uniforms of the two astronauts on the float,” said the environmental management major. “The yellow marigolds we are just storing to be used as dry decorations on future floats.” Worrell, whose middle name coincidentally is Iris, says being part of the Rose Float decoration squad is a great opportunity. “I love the flower fields,” said the sophomore from Brea. “I think it is something really unique to the Rose Float program. 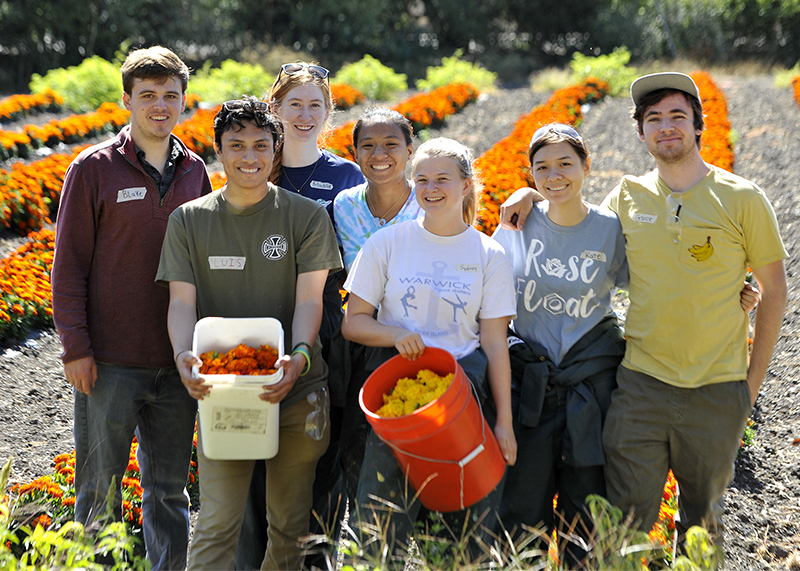 I don't know where else I would get hands-on harvesting and planting experience with flowers.” The team will host its final on-campus lab for volunteers on Saturday, Oct. 13. “Far Out Frequencies” celebrates the 130th Tournament of Roses Parade theme, “The Melody of Life,” and music as a universal language. On the float, a pair of astronauts land on a distant alien planet. Unable to communicate through language, they use musical instruments to share their message of goodwill with the aliens they encounter, leading to out-of-this-world fun and some unexpected good times. It is Cal Poly universities’ 71st entry in the Pasadena classic — a tradition that began in 1949. Zachary Peterson, an associate professor of computer science, was named a fellow in New America’s Cybersecurity Initiative. The fellowship is a one-year, non-resident program hosted jointly by the Open Technology Institute and the Cybersecurity Initiative, an overarching partnership that brings together all New America’s cybersecurity-related work. 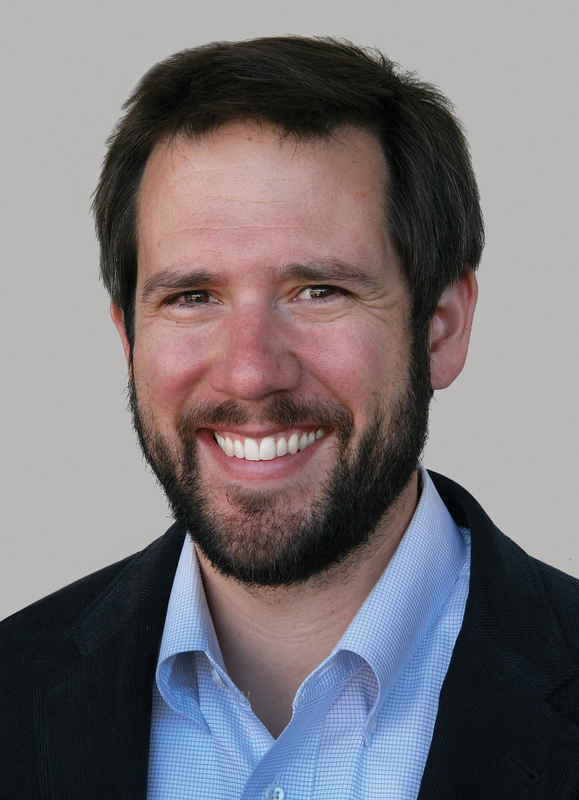 Peterson's research agenda includes developing and evaluating novel approaches to improve cybersecurity outreach and education, especially those methods centered around the use of games and play. As a fellow, his goal is to continue to innovate effective and repeatable methodologies for computer education that measurably increase awareness of computer security, creates a pathway to a career as a cybersecurity professional and provides a fun, inclusive and engaging context for communicating computer security concepts. Tom Visvikis joined Campus Dining in August as its new director. Visvikis brings a diverse background in food service management to a role charged with providing on-site operational leadership, working closely with the dining team to build on Campus Dining successes. 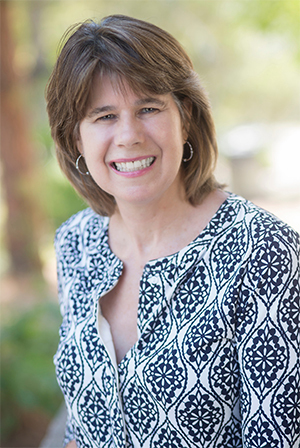 “Tom’s knowledge and expertise in small boutique and high-profile venues will help in continuing to elevate the customer experience throughout our dining program,” said Lorlie Leetham, Cal Poly Corporation executive director. Visvikis will focus on creating a more inspiring dining experience that features an ever-increasing amount of local, fresh foods from sustainable sources. 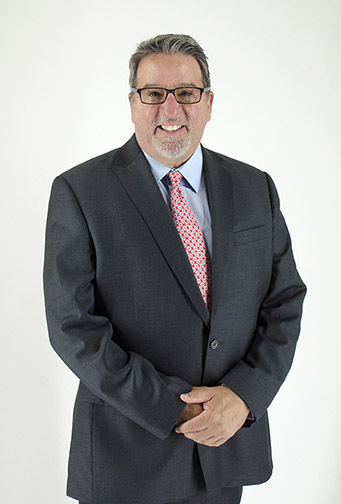 Most recently he served as a district manager of national accounts for Sodexo, a food service and facilities management company, where he worked with the University of Maine, Capitol One and Amgen. During his career he authored and developed award-winning programs for wellness at USAA and sustainability at Microsoft. He also spent time catering high-profile events at the Kennedy Center including presidential inaugural ceremonies. He fills the role previously held by Spyros Gravas, who received a promotion. Transportation and Parking Services is accepting credit cards on location for event parking as well as at the Grand Avenue Visitor Center kiosk. The cash-only system has been updated to accommodate the more popular payment method of today’s campus visitors. The Visitor Center rolled out a trial system last spring, and TAPS started using the system for events over the summer. The update was successful and implemented this academic year. “Because fewer and fewer people carry cash today, credit card payment option was very necessary,” said Marlene Cramer, TAPS director. “It has made everything run smoother in general.” Cash is still accepted at all locations. Any faculty or staff member with a valid parking permit still parks for free in event parking lots. The Chicanx/Latinx Faculty Staff Association will hold its 11th annual Fall Convocation from 4:30 to 6:30 p.m. Thursday, Oct.11, in Chumash Auditorium. 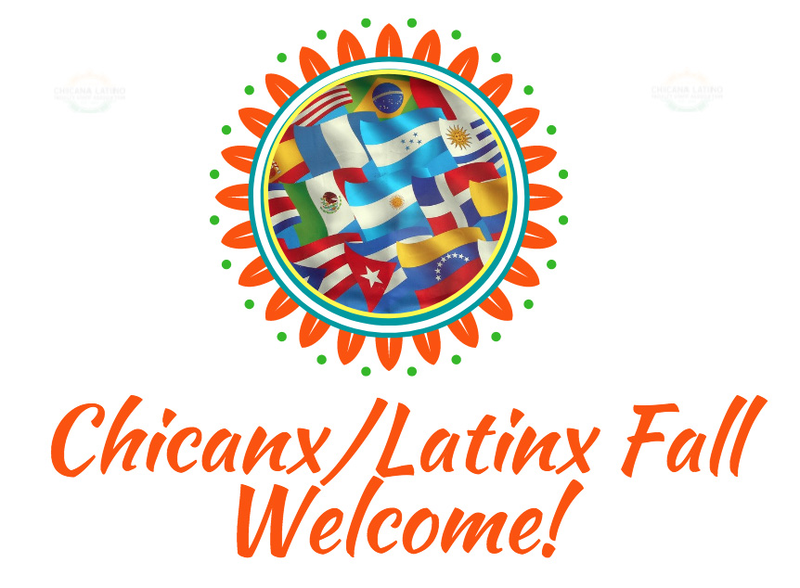 This fall welcome — made possible by CLFSA, Career Services Diversity Support Fund, Office of University Diversity and Inclusion and the Multicultural Center — helps connect Latinx-identified faculty, staff and students. It is open to all students, faculty and staff. To add your name to the email list for future notifications about meetings and events, contact Debra Valencia-Laver at dlvalenc@calpoly.edu. For more information, visit the CLFSA website. 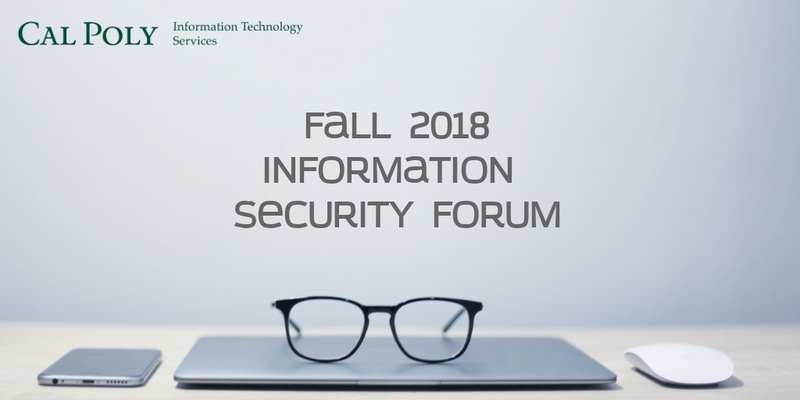 You’re invited to join Information Technology Services in UU Room 220 from 11 a.m. to noon Wednesday, Oct. 10, for the ITS quarterly Information Security Forum. Learn how to keep your passwords safe and demo LastPass, a password management tool available to faculty and staff. ITS Information Security Team members will be on hand to answer questions and help attendees get set up with Last Pass and Duo, an identity verification tool that is required to be used alongside LastPass. For questions, contact Doug Lomsdalen at ext. 6-7686 or dlomsdal@calpoly.edu. Bring your lunch and enjoy a free noon concert on Wednesday, Oct. 10, in the Performing Arts Center Lobby. Opera San Luis Obispo will feature highlights from its upcoming production of Mozart's "The Magic Flute." You'll get a sneak peek of selections from the show, and learn about the production taking place on campus at 2 p.m. on Saturday, Oct. 13, and Sunday, Oct. 14. 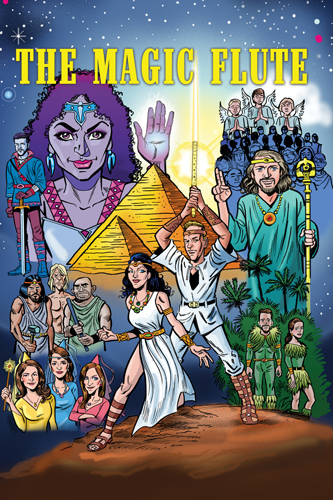 This production was developed for audience members of all ages, and provides an introduction for first-time opera-goers. Attendees to the noon concert can also enter to win two free tickets to the show. Cal Poly employees receive 10 percent off using promo PACSLO. Visit the PAC website to purchase online. The concert is sponsored by PAC Outreach Services. October’s short NINJIO information security training video, “A Terminal Mistake,” is timely as students, faculty and staff are frequent targets of ongoing phishing campaigns. The three-minute video highlights what you should be aware of when looking through your email inbox to avoid getting phished and letting your personal information fall into the wrong hands. NINJIO releases a new security topic each month, aimed at spreading security awareness. All videos are available through Skillsoft under the Staff and Faculty Training tab on the My Cal Poly Portal. In appreciation for what faculty and staff members do for the university, Cal Poly Athletics will offer four free general admission tickets to the men’s soccer match on Sunday, Oct. 21, as part of Faculty/Staff Appreciation Night. Cal Poly will host UC Irvine in the final regular season home match at 5 p.m. in Spanos Stadium. 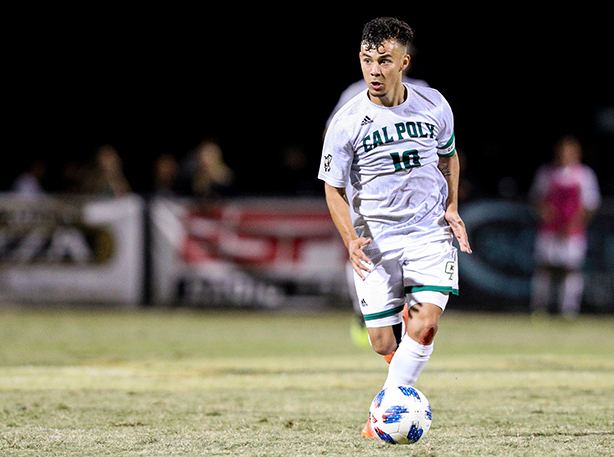 All faculty and staff can claim their free tickets to the match by showing their Cal Poly ID at the Cal Poly Ticket Office or at the Spanos Stadium box office on the night of the match. For more information or to purchase tickets to other men’s soccer matches, visit www.gopoly.com. 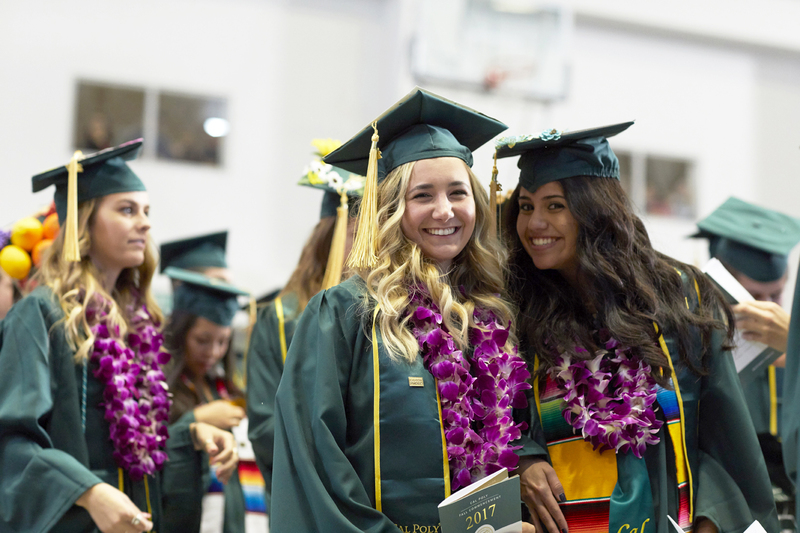 The Distinguished Scholarship Award recognizes the scholarship, research and creative activity of both junior and senior faculty members across all disciplines at Cal Poly. Faculty are encouraged to nominate their fellow faculty members for this award as well as notify their students about it. See the Distinguished Scholarship Award website for more information. Nominations are due by Wednesday, Oct. 31. For more information, contact the Academic Senate Office at ext. 6-1258 or academic-senate@calpoly.edu. 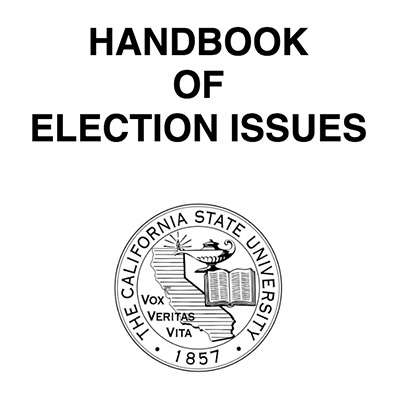 With the 2018 election season in full swing, university legal counsel encourages employees to review the CSU handbook on election issues. The handbook will educate faculty and staff on appropriate ways to become involved in elections without using university resources or appearing to represent the university, unless authorized by law. The handbook is intended as general guidance only. Specific questions related to elections or political activity can be directed to the appropriate dean’s office or supervisor, who will consult with the Office of University Counsel. Cal Poly researchers now have a “week” for them — and lucky researchers may win an iPad and other prizes. The Office of Research and Economic Development is hosting a series of events Oct. 23-24 to provide support and enhance collaboration for research at Cal Poly. Plug Into Research Support will give faculty, staff, and student researchers the opportunity to meet with research administration, grants development and sponsored programs staff to learn about support programs, funding opportunities, compliance processes and intellectual property protection. 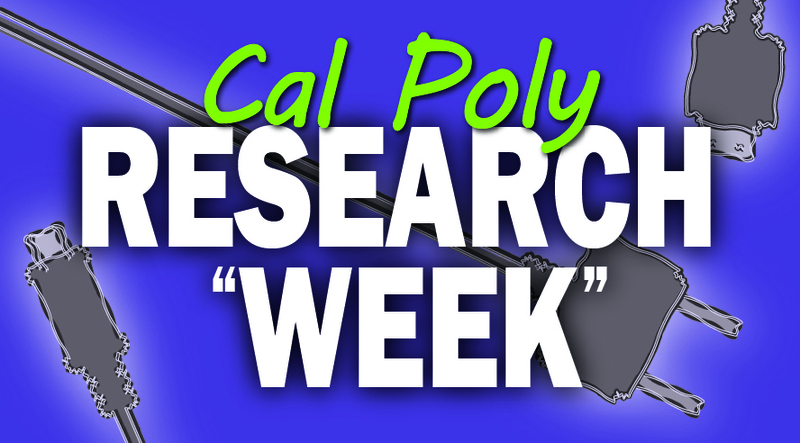 Attendees can get their questions answered, pick up some Cal Poly research swag and be entered in a prize drawing. This resource fair-style event will be held in the high bay of the Bonderson Project Center (No. 197), Room 107, from 10 a.m. to 1 p.m. Tuesday, Oct. 23. Refreshments will be provided. Later that day, from 3:10-5 p.m., Research Lightning Talks will feature brief 4-minute presentations by 10 research faculty seeking collaborators from departments all over campus. The talks will be followed by a networking session with beverages and hors d’oeuvres. Researchers seeking information on how to get started with funded research or improve rejected proposals should attend the Grants 2.0 Workshop from 8:10-10 a.m. Wednesday, Oct. 24. Representatives from the Office of Research and Economic Development and Hanover Research will present information on grant administration, funders and funding and proposal development. Both the Research Lightning Talks and the Grants 2.0 Workshop will be held in the Advanced Technology Laboratories (No. 7). For more details, visit ORED website or call ext. 6-5153. The Warren J. Baker and Robert D. Koob endowments are accepting proposals through Monday, Nov. 5, for student projects that provide hands-on, project-based learning opportunities. The endowments will have $51,000 available to support the proposals. The typical range for grants is up to $2,500 for individuals and a maximum of $5,000 for group projects. A faculty committee representing all six colleges will review proposals. Successful past grant proposals represented a wide range of academic programs and ideas. Recipients will be announced before the holidays and projects can begin in January. Students have a year to complete their projects. Detailed information and proposal forms are available on the provost's website. The Cal Poly Foundation Board of Directors will hold its meeting, which is open to the public, beginning at 9:30 a.m. Saturday, Nov. 10, in the Performing Arts Center Pavilion Room. For more information about the meeting or to obtain a copy of the agenda, call the Cal Poly Foundation office at ext. 6-7147. 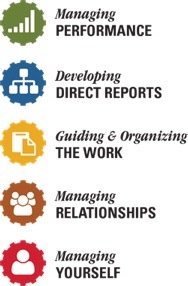 Employee and Organization Development is offering another session of the highly regarded Principles of Supervision workshop. Would you like to optimize your role as a supervisor? Are you interested in gaining additional skills to ensure the work gets done, to engage employees to perform and influence your group to work as a team? Recent workshop participants said they “can use these tips immediately,” and were excited “to put what (was) learned into action.” Principles of Supervision will offer helpful information and tools through four non-consecutive half-days running from 8:30 a.m. to 12:30 p.m. each day in Kennedy Library (No. 35), Room 209. The workshop starts Friday, Oct. 26 and continues on Nov. 6, Nov. 27 and Dec. 18. Get more information and register here. Patty Van Belleghem, research associate for Institutional Research, will retire after 25 years of service. Van Belleghem joined the University Health Center in 1992, and after several years, moved to University Scheduling. In May 2005 Van Belleghem transferred to Institutional Research, then known as Institutional Planning and Analysis. While at Cal Poly, Van Belleghem took advantage of the Employee Fee Waiver Program, completing a bachelor’s degree in history and a master’s degree in educational leadership. One of the highlights during her time at Cal Poly was serving as advisor for Alpha Pi Sigma sorority for more than four years, making lifelong friendships with incredible young women. After retirement, Van Belleghem plans to spend more time with family, explore new volunteer opportunities and discover new trails as an avid runner and hiker. Van Belleghem's last day is Friday, Oct. 12. A retirement reception will be held from 1 to 3 p.m. Oct. 12, in the Administration Building (No. 1), Room 301. Questions? Contact Tamarra Mellick at tmellick@calpoly.edu. 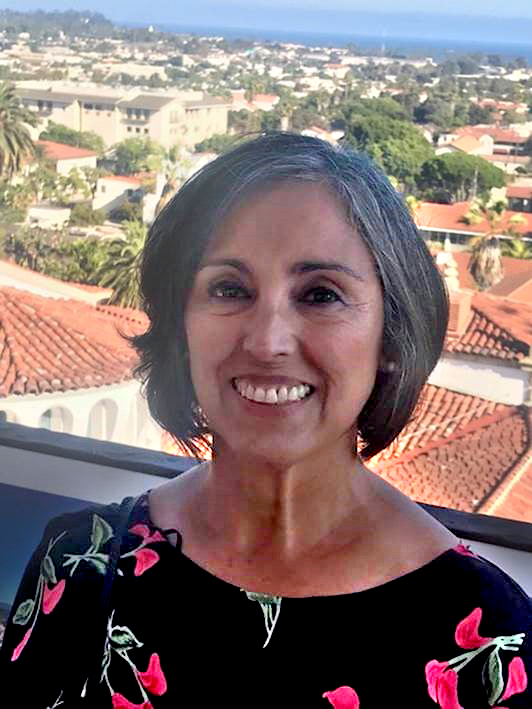 Susan Stewart, analyst/programmer for Student Academic Services, will retire in November after 35 years of service to Cal Poly. Stewart joined the Financial Aid Office in 1980 as a student assistant, moved to a staff position in July 1983, and quickly advanced to become a senior data control technician. She worked on the IBM System/36, using Z-Writer and FOCUS programming code. Stewart moved to Student Academic Services in 1990 where she flourished for the next 28 years, increasing her skills in database development. She has been instrumental in developing FileMaker databases in use by many of the programs. Stewart was honored with the Student Affairs Outstanding Employee Award in 1996 and the Chandler Award in 2009. She is one of those rare individuals who has outstanding technical aptitude, but also the capacity to deal with people with incredible empathy. After retirement, she plans to travel the globe with her husband, Steve, in addition to partaking in many volunteer opportunities. A retirement reception will be held from 2-4:30 p.m. on Monday, Oct. 29 in the Bonderson Engineering Project Center (No. 197), Room 104. Please contact Angela Marino at amarin07@calpoly.edu with any questions. Alex G. Spanos, Cal Poly alumnus and a major supporter and philanthropist for the university and, more recently, longtime owner of the National Football League's Los Angeles Chargers, died Oct. 9. He was 95. He studied aeronautical engineering in 1941-42. Spanos was a member of the men's swimming team, and, with his brother Danny, was a member of the Men's Glee Club (where the pair had a novelty tap dancing act) and served as a drum majors on the marching band. 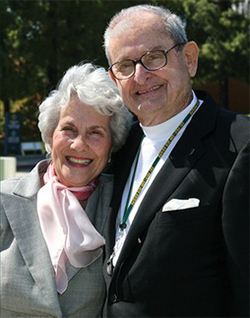 Since then Spanos, and his wife, Faye, made significant contributions to the university and stayed connected with the campus community: In 2003, the couple donated $1.5 million to help fund the remodel of the Cal Poly Theatre — now named the Alex and Faye Spanos Theatre. A year later, his $8 million donation to renovate the university's football stadium is one of the most significant gifts in the history of Cal Poly Athletics. After being rededicated in his honor in 2006, the stadium bears his name and hosts many of Cal Poly's most high profile annual events, including football and soccer games, spring commencement ceremonies, and the rodeo during Open House. Alex G. Spanos was born on Sept. 28, 1923, in Stockton, Calif. He married his wife, Faye, in 1948, raised four children — Dean, Dea, Alexis and Michael — and became prolific philanthropists, donating to causes related to schools, children, the arts and hospitals. He was preceded in death by Faye, who died in August, at the age of 92. Read more here. Nico Ambrecht, custodian in Facilities Management-Custodial Services, has qualified for catastrophic leave. Those wishing to donate leave credits to help him remain in full-pay status during an extended leave of absence should contact catastrophic leave coordinator Laura McCarren at ext. 6-5212 or lmccarre@calpoly.edu to request a donation form. 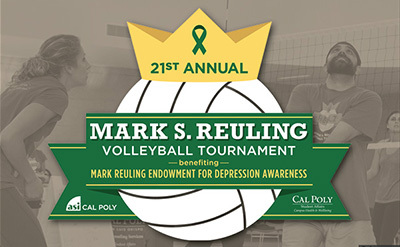 Join ASI Recreational Sports and Campus Health and Wellbeing for the 21st annual Mark S. Reuling Volleyball Tournament on Friday, Oct. 19, at the Recreation Center. Pam and Ed Reuling, parents of Cal Poly alumnus Mark Reuling, created a memorial endowment to honor their son, who lost his life to bipolar disorder. Each year, the tournament aims to raise funds for the Reuling Memorial Endowment and to promote education and prevention programs regarding bipolar disorder and depression for the campus community. Students, faculty, staff and campus community members are eligible to participate including alumni, retirees/emeriti and partners/dependents of current employees. The tournament has two divisions: a faculty/staff division held indoors in the Recreation Center Rec Gym from 11 a.m. to 1 p.m.; and a student division held at the Recreation Center sand volleyball courts from 1:30 to 4 p.m. Registration costs $60 for each six-person faculty/staff team and $40 for each four-person student team. All participants will receive an event T-shirt. One team member can register and pay for the entire team through ASI Access for faculty/staff registration and student registration. For more information, contact Greg Avakian, ASI recreational sports director, at 6-5846 or gavakian@calpoly.edu. The tournament caps off ASI Student Government’s Buck the Stigma Mental Health Awareness Week that starts on Monday, Oct. 15, and will include daily events to educate and eliminate stigmas involving mental health disorders. 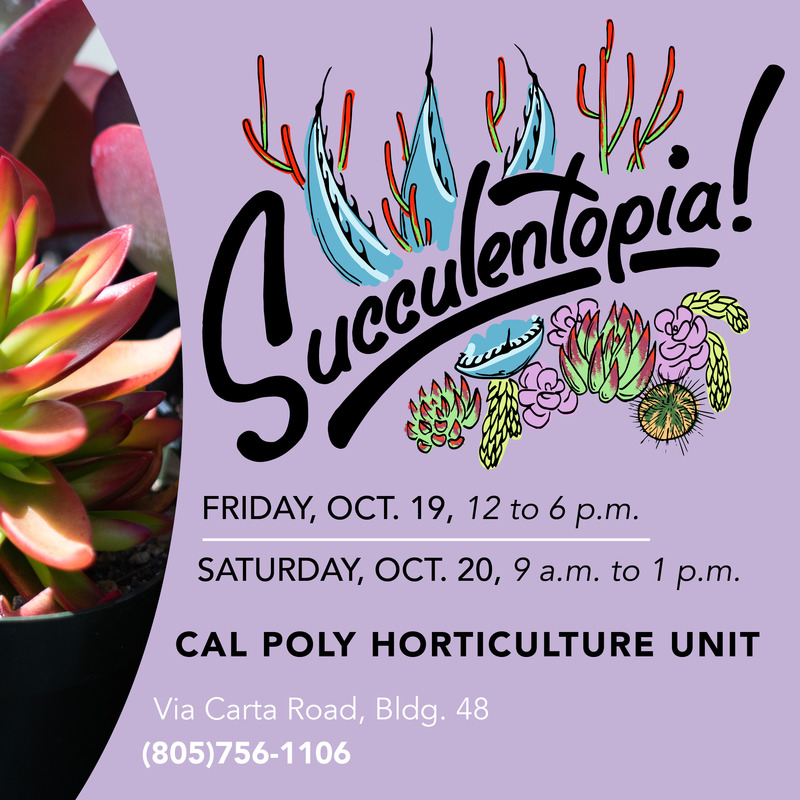 More than 125 varieties of succulents will be available at the Succulentopia plant sale from noon to 6 p.m. Friday, Oct. 19, and 9 a.m. to 1 p.m. Saturday, Oct. 20, at the Horticulture Unit near the Poly Plant Shop. More than 2,500 plants will be available for purchase. Five students are involved in the student-run project, one of several such hands-on experiences offered by the College of Agriculture, Food and Environmental Sciences’ Horticulture and Crop Science Department. In this sale, size determines the plant: 4-inch pots, $4.50; 4.5-inch pots, $5.50; 6-inch succulent garden, $12.50; 8-inch succulent garden, $25; and additional large plants priced accordingly. Cal Poly will celebrate the grand opening of the yakʔitʸutʸu housing community on Thursday, Nov. 8, with a host of activities and cultural programs for the campus community. The university’s celebration will kick off at 2 p.m. with tours of buildings and the community’s unique landscaping features, followed by a 3 p.m. dedication ceremony. There will also be educational booths, native foods and music. RSVP here. 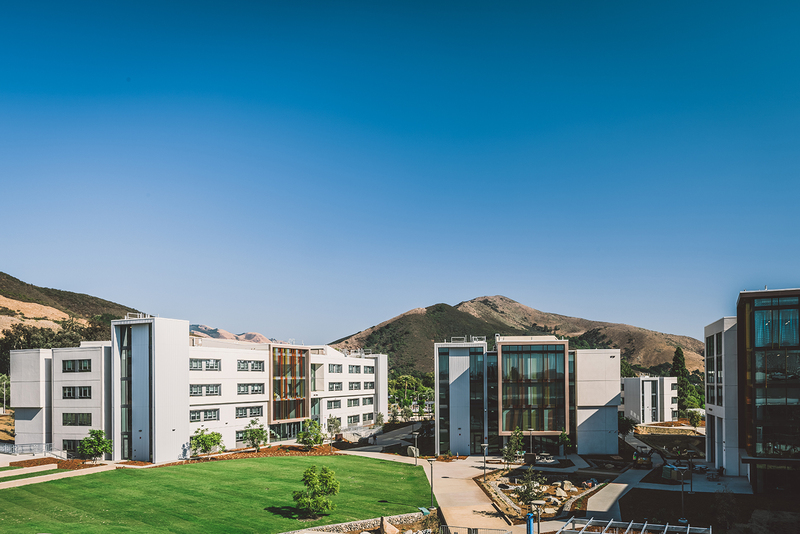 Named in honor of the indigenous peoples of San Luis Obispo County, the Northern Chumash, yakʔitʸutʸu opened in September and features seven buildings that collectively house 1,475 first-year students. Located at the Grand Avenue entrance to campus, the LEED-designed community includes a roof-mounted 1.1 megawatt solar system, a campus welcome center, open space with native plants, study and community rooms, laundry facilities, office and workspace, among other amenities.To learn more about yakʔitʸutʸu, visit www.housing.calpoly.edu/ytt. To see a video of the project visit https://www.youtube.com/watch?v=EPwFtJGafwM. Practice your language skills, learn more about the German and Russian culture, and meet new friends. The German Conversation table, which will be open every other Thursday, started Oct. 4 and ends Nov. 15. It will be held from 11:15 a.m. to noon in the faculty fishbowls near Julian’s Café in Kennedy Library. The Russian Conversation table will be open every other Thursday beginning Thursday, Oct. 11, and ending Nov. 29, from 11:15 a.m. to noon in the same location. Everyone interested in speaking German and Russian or just listening is welcome. For more information, contact Angelica Browne at anbrowne@calpoly.edu or Olga Dekhtyar at odekhtya@calpoly.edu. Do you need legal advice? Legal consultation can give you the foundation to take the most effective steps necessary for your situation. Associated Students Inc. has contracted with San Luis Obispo attorney Jeff Radding for the past 33 years to provide free legal advice to the campus community. This service is available to current Cal Poly students, faculty and staff. Radding provides a free, 15-minute consultation by appointment no matter the issue. Fall quarter appointments are available from noon to 2 p.m. on Fridays, Oct. 12, Oct. 26, Nov. 9 and Dec. 7. To schedule an appointment, call the ASI Business Office at ext. 6-1281. Consultations are held in the ASI Business Office located in Room 212 of the University Union. 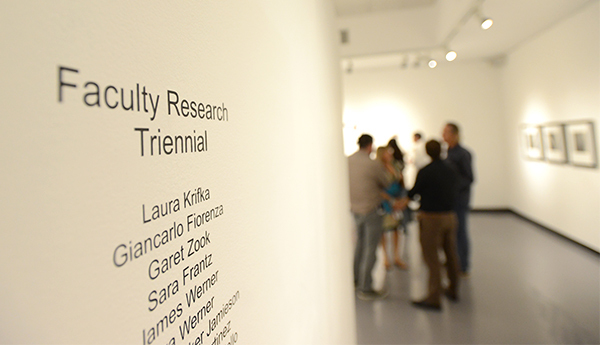 The University Art Gallery's The Faculty Triennial exhibit continues on display through Oct. 26. The exhibit demonstrates the high caliber of work that can be achieved with time and practice as Cal Poly’s Art and Design faculty showcase the work they create outside the classroom as professional artists. Eighteen professors and lecturers will display pieces in the practices of sculpture, painting, video, photo, digital media and graphic design. The University Art Gallery in the Dexter Building (No. 34) is open Tuesday through Saturday, from 11 a.m. to 4 p.m. For more information, contact the University Art Gallery at ext. 6-6038. 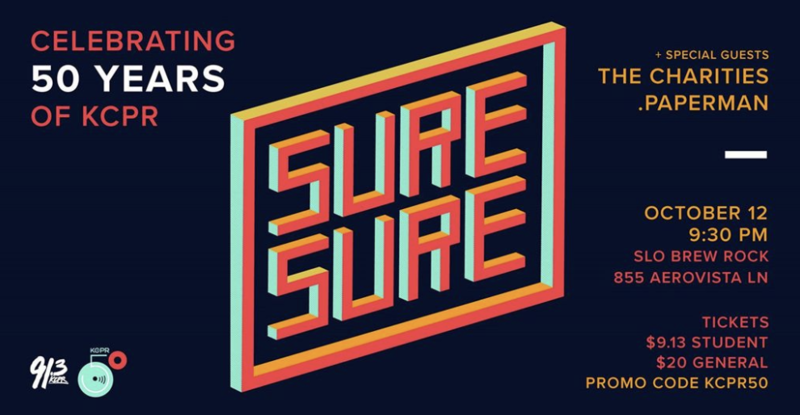 As part of the 50th anniversary celebration of KCPR, the station is hosting a benefit concert featuring Los Angeles pop band Sure Sure and opening acts, The Charities, a soul, funk based band from Hermosa Beach, and .paperman (Bryant Keith Bayhan), a local. Don't miss this party for KCPR at 9:30 p.m. Friday, Oct. 12, at SLO Brew Rock in San Luis Obispo. Come listen to great music and hang out with KCPR staff members and listeners from every decade. Tickets are $20 and all proceeds support KCPR. Get tickets and learn more about other anniversary weekend events. 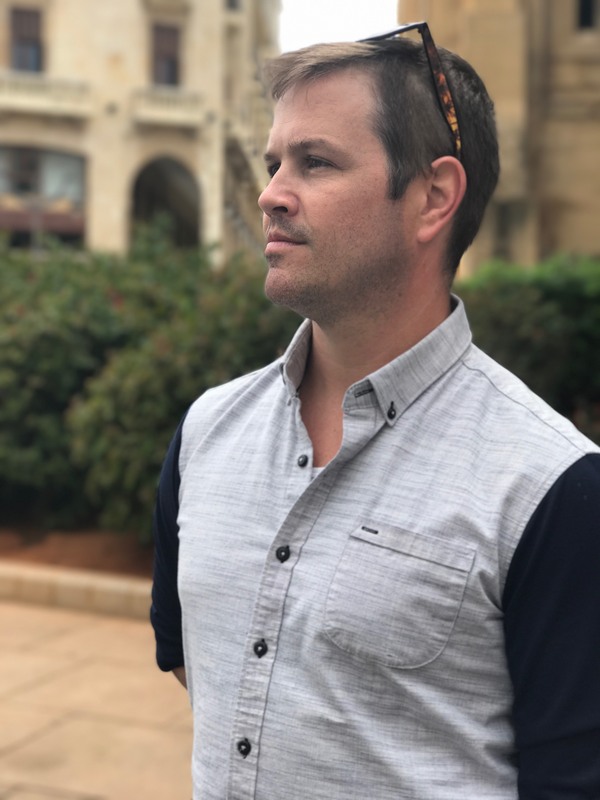 Matthew Henley, dance professor at Texas Woman’s University, will give a lecture about intelligence in the arts from 2:10 to 3 p.m. Friday, Oct. 19, in the Baker Center (No. 180), Room 101. Henley will discuss philosophical, cognitive and neuroscientific justifications for viewing artistic practice and arts education as environments for the manifestation of intelligence. Adopting a neurodiversity framework, Henley will frame the revaluation of artistic ways of knowing and being in the world as a diversity and inclusion strategy, leveraging individual aptitudes in the arts as a way to support academic, professional and personal success. Henley will also choreograph a piece for Cal Poly’s Orchesis Dance Company, and the public is invited to watch a rehearsal from 1:30 to 3 p.m. on Saturday, Oct. 20, in the dance studio in Crandall Gymnasium (No. 60, Room 6). 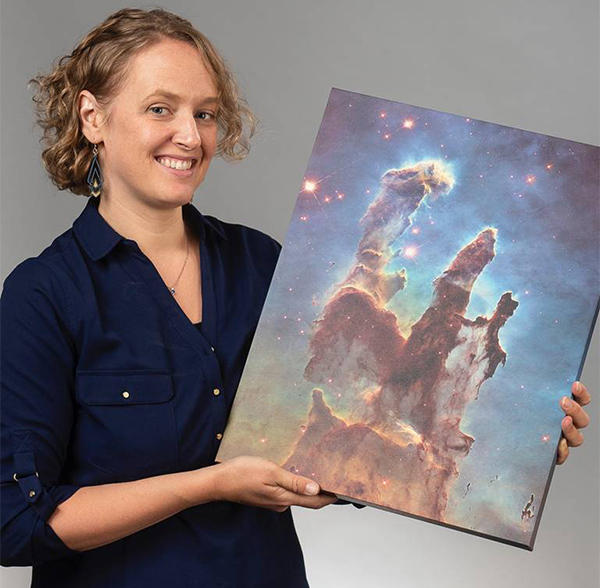 Henley earned a bachelor's degree in religious studies and bachelor of fine arts degree in dance from the University of Arizona. While in Tucson, Henley worked with Orts Theater of Dance, an aerial modern dance company. After graduating, he moved to New York City and began working with Randy James Dance Works, where he taught extensively throughout the New Jersey and New York public school systems. In 2004, he became a member of the Sean Curran Company, where he danced until moving to Seattle. He earned a master of fine arts in dance and a doctorate in educational psychology at the University of Washington. For more information, email Professor Christy Chand at cmchand@calpoly.edu. The Music Department will present a faculty showcase recital at 6:30 p.m. Friday, Oct. 19, in Room 218 of the Davidson Music Center (No. 45). Recital coordinator Christopher J. Woodruff said the intent of the recital is to enable music students to see their instructors perform. 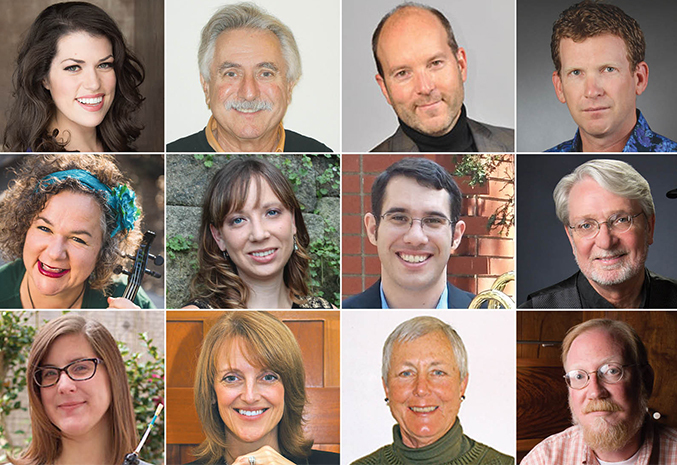 Up to 12 faculty members are slated to perform, including Amy Goymerac, soprano; Brynn Albanese, violin; Heidi Butterfield, oboe; Keith Waibel, clarinet; Laura Kramer, baritone saxophone; Lisa Nauful, bassoon; Mark Miller, trombone; Barbara Spencer, cello; John Astaire, percussion; and Ken Hustad, bass. Woodruff will play trumpet. University organist and staff accompanist Paul Woodring will play piano. The program will include a variety of works, including the 20th century works “Valse Miniature” from Serge Koussevitsky’s “Morceaux,” and a movement from Francis Poulenc’s “Trio for Oboe, Bassoon and Piano.” More recent works are Donald Erb’s “Diversion for Two,” Bruce Broughton’s “Oliver’s Birthday” and Matthew Peterson’s “Smooth, Fat, Nasty.” Waibel, Spencer and Woodring will perform a piece by local composer Alan Boehmer titled “Remembrances.” Admission is $5 at the door. Parking is free after 5 p.m. in the Grand Avenue parking structure (Lot 130). For more information, visit the Music Department calendar website or call ext. 6-2406. 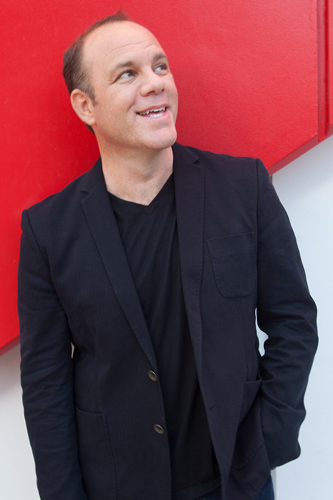 Comic Tom Papa performs at 8 p.m. Friday, Oct. 19, in Harold Miossi Hall, presented by Cal Poly Arts. With more than 20 years as a stand-up comedian, Papa is one of the country’s top comedic voices, finding success in film, TV, radio and podcasts, as well as on the live stage. One of Jerry Seinfeld’s favorites, Papa returns to the PAC with his signature old-school charm tinged with hilariously offbeat musings on life and its absurdities. His new book, “Your Dad Stole My Rake … and Other Family Dilemmas,” was released in June. The opening act is Paul Morrissey. Tickets range from $24-$39 and can be purchased at the Cal Poly Ticket Office from noon to 6 p.m., by calling ext. 6-4849 or online on the PAC website. The show is for ages 13 and older. Cirque Mechanics performs 42 FT — A Menagerie of Mechanical Marvels at 8 p.m. Saturday, Oct. 20, in Harold Miossi Hall, presented by Cal Poly Arts. Inspired by contemporary circus, Cirque Mechanics finds its roots in the mechanical and its heart in the stories of American industrial ingenuity. This new theatrical production displays a raw quality rarely found in modern circus as their edge-of-your-seat, breathtaking signature style is wrapped in acrobatics, mechanical marvels and just a bit of clowning around. Tickets range from $36-$62 ($29-$50 for student, faculty and staff) and can be purchased at the Cal Poly Ticket Office from noon to 6 p.m., by calling ext. 6-4849 or online on the PAC website. 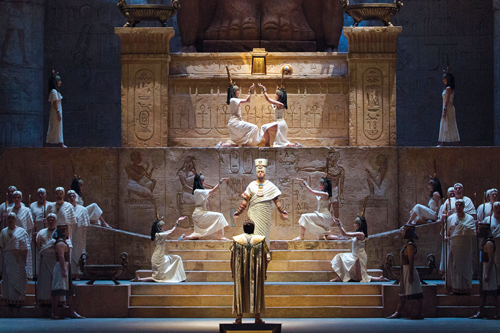 The Metropolitan Opera’s “Aida” is screened live in HD at 2 p.m. Sunday, Oct. 21, in Harold Miossi Hall, presented by Cal Poly Arts and Opera SLO. Soprano Anna Netrebko sings her first Met "Aida," with mezzo-soprano Anita Rachvelishvili as her formidable rival Amneris. Aleksandrs Antonenko is the warrior Radamès, and Nicola Luisotti takes the podium for the Met’s monumental production. (Encore). Tickets are $22 for adults and $12 for students, faculty and staff. They can be purchased at the Cal Poly Ticket Office from noon to 6 p.m., by calling ext. 6-4849 or online on the PAC website. 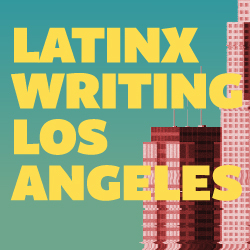 Victor Valle, professor emeritus of journalism and now serving in the Ethnic Studies Department, will discuss his 2018 edited volume, "Latinx Writing Los Angeles: Nonfiction Dispatches from a Decolonial Rebellion." This collection of nonfiction writing illuminates divergent, hybrid Latinx histories and cultures. Valle's conversational partner will be José A. Navarro, assistant professor in the ethnic studies department. The discussion will take place from 10 to 11:30 a.m. Friday, Oct. 26, in Kennedy Library (No. 35), Room 111H. There will be time for audience questions, and light refreshments will be served. The event is part of Kennedy Library’s Conversations with Cal Poly Authors series. Listen to podcasts of past conversations on SoundCloud. Cal Poly’s 2018-19 large choral ensembles will be introduced at 8 p.m. Saturday, Oct. 27, in Mission San Luis Obispo de Tolosa. PolyPhonics and the University Singers will present a fall concert titled “Luminous Night of the Soul,” which will showcase the talent of the Cal Poly vocal program and to give listeners a taste of the year to come. The University Singers will perform a portion of the well-known “Solemn Vespers” by Wolfgang Amadeus Mozart, as well as modern works by Craig Hella Johnson and Gwyneth Walker. 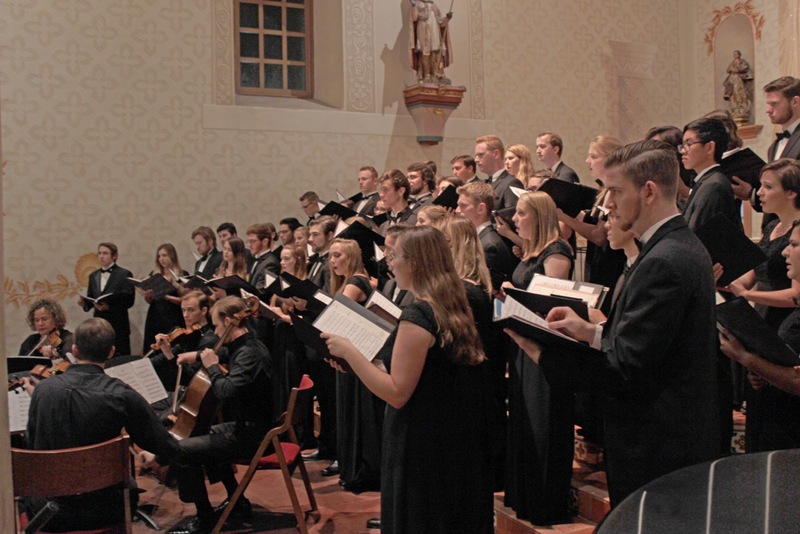 PolyPhonics, the university’s premier choir, will perform Ola Gjeilo’s “Luminous Night of the Soul” along with a string quartet composed of Cal Poly students. The choir will also perform Ēriks Ešenvalds’ hauntingly beautiful “Only in Sleep.” Several vocal solos will highlight the diversity and skill of the department’s student vocalists. Paul Woodring is the accompanist for the choirs. Director of Choral Activities Scott Glysson conducts the choirs. Glysson recently returned from a trip to Kenya where he conducted the Nairobi Women’s Chorus. Tickets for the concert are sold at the Cal Poly Ticket Office, ext. 6-4849. For more information, visit the Music Department calendar website or call ext. 6-2406. Swimming and Diving hosts Alumni Meet, Anderson Aquatic Center, 11 a.m.
Men’s Basketball hosts Green vs. Gold Game, Mott Athletics Center, 1 p.m.
Men’s Soccer vs. Sacramento State, Spanos Stadium, 7 p.m.
Women’s Soccer vs. Hawai’i, Spanos Stadium, 7 p.m.
Football vs. UC Davis, Spanos Stadium, 4 p.m.
Men’s Soccer vs. UC Irvine, Spanos Stadium, 5 p.m.
#105019 — Instructional Support Technician II, Academic Affairs — College of Agriculture, Food and Environmental Sciences. $3,748-$6,582 per month. (Anticipated hiring range: $4,500-$5,200 per month). Open until filled. #105049 — Information Technology Consultant (Information Technology Consultant — Career), Academic Affairs — College of Science and Mathematics. $4,372-$10,478 per month. (Anticipated hiring range: $5,000-$6,500 per month.) Open until filled. #105054 — Administrative Support Assistant II, Academic Affairs — College of Science and Math — Advising Center. $2,600-$4,458 per month. (Anticipated hiring range: $3,000-$3,400 per month). Open until filled. #105053 — Career Counselor (Student Services Professional II), Student Affairs — Career Services. $4,179-$5,942 per month. (Anticipated hiring range: $4,179-$4,388 per month). Open until filled. #105034 — Campaign Communications and Web Specialist (Public Affairs/Communications Specialist II), University Development — Donor Relations. $3,515-$6,173 per month. (Anticipated hiring range: $3,515-$5,500 per month.) Open until filled. Maintenance Supervisor, Campus Dining, $25.40-$38.09 per hour. Outreach Coordinator, Educational Talent Search, Student Academic Services, $34,110-$36,497 annually. Coordinator — Recreational Sports. Annual salary $52,794 with excellent benefits. Position open until filled. Coordinator — Aquatics and Safety. Annual salary $52,794 with excellent benefits. Position open until filled. Assistant Coordinator — Accounting. $22.50/hour with excellent benefits. Position open until filled. Teacher. $15.44/hour with excellent benefits. Position open until filled.